Christie Cobb was recently selected as the Exceptional Children’s Teacher of Excellence for Edgecombe County Public Schools. The award recognizes individuals who are leaders in service to the school system through innovative instructional programs or methodologies that have demonstrated positive outcomes for students with disabilities. Cobb is an Exceptional Children’s (EC) teacher at G.W. Carver Elementary School. Cobb began her teaching career 25 years ago after graduating with a Bachelor’s Degree in Special Education from East Carolina University. She also earned an Associate’s Degree in Education from Chowan College. She received National Board Certification in 2008 and renewed this year. She holds multiple North Carolina Teaching Licenses in Special Education. “Mrs. Cobb is just a phenomenal teacher. She represents everything about who most teachers really are, with a heart that is as caring and supportive as anyone I have ever met. Mrs. Cobb goes so far above and beyond for her students and their families. She works tirelessly to ensure that her students have a creative, challenging, engaging, and supportive classroom environment each and every day. She pushes her students to go further and to challenge their limits, all while making sure they know she is there to catch them and support them when they falter,” said Thomas Holland, principal of G.W. Carver Elementary School. “When parents drop their students off with Mrs. Cobb, they know they are sending them to a place of joyful learning and engagement with an adult who loves them. As a principal, having a teacher like her as part of the team just helps to inspire me daily. We are excited and honored that she is a member of the Carver family,” added Holland. 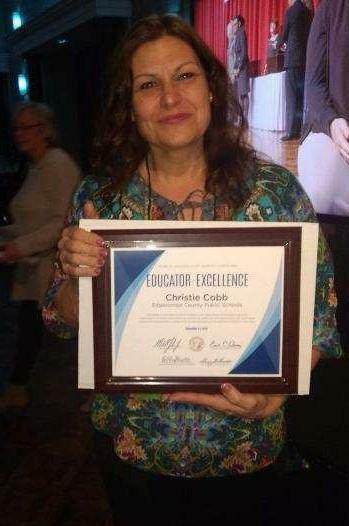 Cobb was recognized as the Teacher of Excellence at a reception during the North Carolina Exceptional Children’s Conference held earlier this month at the Koury Convention Center in Greensboro.